PRE-INSTALLED WITH 20 CLASSIC RETRO GAMESRelive the moments that changed gaming forever, with the innovative PlayStation console. 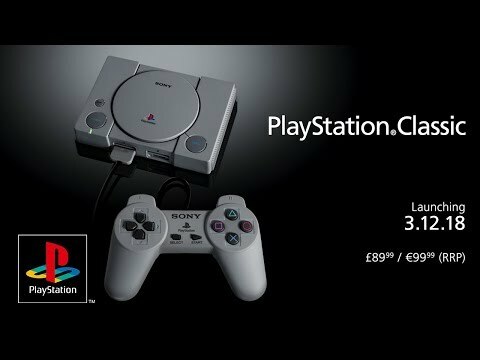 Sony are excited to announce that they are bringing back the original PlayStation experience for the fans, to celebrate 20 Years of PlayStation in a new miniaturised design the PlayStation Classic! The console will arrive pre-loaded with 20 classic titles, two replica controllers and virtual disc and save features. 1994 ORIGINALDeveloped by then Sony Computer Entertainment, it was the first home console in video game history to ship 100 million units worldwide, offering consumers a chance to play games with real-time 3D rendered graphics for the first time in their own homes. 2018 REDESIGNThe PlayStation Classic mirrors the original, the Open button changes a virtual memory disc, plus a virtual memory card saves your adventures as you switch between your favourite old school games. The Classic mini replicates 90s gaming with a modern twist. REDESIGNED WITH A HDMI The mini console is approximately 45% smaller than the original 1994 PlayStation, the Classic mini emulates the original’s look and feel by featuring the same logo, button layout and even the packaging. All of the classic games will be playable in their original format, brought into the future with a HDMI output cable to plug into most modern TVs, whilst the Reset button suspends games. SONY ERGONOMIC DESIGN Every unit includes two controllers for local multiplayer within compatible titles. The original PlayStation controller changed the way we play, with four shoulder buttons now you can experience retro gaming with the classic design of the PlayStation controller, before the DUALSHOCK Analog controller was introduced. REMINISCE THE GOOD OLD DAYS Almost 25 years ago, the original PlayStation was introduced to the world, time has flown by and the PlayStation is now considered a retro games console. Long-time fans will appreciate the nostalgia that comes with rediscovering the games they know and love once again, while gamers who might be new to the platform can enjoy the ground breaking PlayStation console experience that started it all. The PlayStation Classic console comes pre-loaded with 20 classic titles, including fan-favourites such as Final Fantasy VII, Jumping Flash, R4 Ridge Racer Type 4, Tekken 3 and Wild Arms with many more. Battle Arena ToshindenPick your warrior, master their moves and step into this ground-breaking 3D fighting arena. Cool Boarders 2Grab your board, shred the slopes and compete on the halfpipe to perform snowboarding’s gnarliest tricks. Destruction DerbyGet behind the wheel to race and wreck your opponents in a series of destructive events. Final Fantasy VIISave the world with Cloud Strife in one of the most iconic adventure in the Final Fantasy series. Grand Theft AutoCause chaos across three cities in the debut game from the iconic GTA series. Intelligent QubeTest your problem solving powers and trust your wits in this classic PlayStation puzzle game. Jumping FlashSave the world from destruction in one of the first 3D platforming adventures. Metal Gear SolidBecome Solid Snake in the first instalment of this all-time classic action-adventure stealth game. Mr DrillerRely on your quick wits and forward thinking as the blocks start falling around a drill-wielding hero. Oddworld: Abe's OddyseeMake your escape through platforming levels and solve puzzles as you fight for Abe’s freedom. Revelations: PersonaJoin forces with a group of high school friends as they harness their Personas to battle evil demons in this immersive JRPG. RaymanLead the loveable and courageous Rayman through a fantastical world of platforming adventure. Resident Evil Director's CutFight your way through a mansion infested with zombies and monsters in this genre-defining horror classic. R4: Ridge Racer Type 4Drive for your team and master your powerslide technique as you go head-to-head with racing rivals. Super Puzzle Fighter II TurboMatch coloured blocks to crush your opponents in a series of arcade-style puzzle battles. Syphon FilterEngage your enemies with stealth, action and tactical combat on a mission to save the world. TEKKEN 3Master the fighting styles of King, Kazuya, Jun and a roster of the greatest warriors from the TEKKEN series. Tom Clancy's Rainbow SixPlan your missions, choose your operatives and use stealth and tactics to defeat terrorist enemies. Twisted MEtalGet behind the wheel of heavily armoured, weaponised vehicles and compete in the Twisted Metal tournament. Wild ArmsExplore a fantasy version of the Old West and wield powerful weapons in a unique and immersive JRPG. YEARS OF GREAT GAMES CONSOLES Take a trip down memory lane with this compilation video from Sony, of some of the greatest games to make their mark on the original PlayStation.